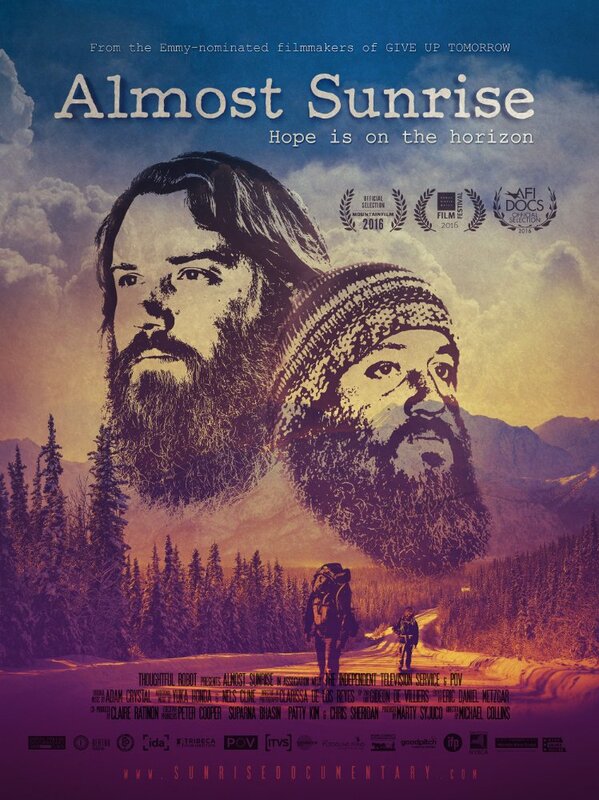 ALMOST SUNRISE is the story of Tom Voss and Anthony Anderson, two veterans who decide to walk across America hoping to find a way to heal themselves by spreading awareness of PTS and the fact that 22 vets kill themselves everyday. We have to applaud Michael Collins for making a film that genuinely will move you to tears. To be certain there are a couple of big moments where you would think you would react emotionally, however, quite unexpectedly, there are several moment in ALMOST SUNRISE where I was reaching for something to wipe my eyes, not because there was some great cathartic moment going on but because I simply felt something for Voss and Anderson as fellow human beings and not characters on the big screen. These men are our friends and family and we are moved. Collins has a made a film where life in all its small moments are on the big screen and we are so much better for it. For example the inter-play between the men and their families is absolutely priceless. Collins doesn't over use sequences or discussions of the men as military people, we know who they are, that's why we are hearing these stories, rather he cuts things so that the men and their families are seen as families to the point where if you didn't know what the larger context was you would think its just a family drama. Its an achievement that makes us care about Voss and Anderson so much more than if the were simply soldiers. They are ultimately us, or our sons or brothers or husbands. I love that director Michael Collins has fashioned a film that transcends what has become an over crowded and over done genre of documentary, the wounded vet film. There is no doubt that we must help the men and women who keep us safe in anyway we can. We must make sure that they get the help they need. Many filmmakers have correctly realized that the perfect way to make sure they get the help is to tell their stories. Unfortunately most do so in ways that lessen them by making each story seem like every other one. While the stories are similar, the films don't have to be, since no two soldier is exactly the same. Filmmakers need to break away from the same story construction drum beat. You may think its easy to relate the whole world to two men or even to just the few of us in the audience and you'd be wrong. Yes, you can intellectually make the connection,- we know these men are supposed to be all all men because that's what film does but to be able to do so in such away that we're reaching for a tissue to wipe away tears because the only thing on screen are two men walking and talking is something truly special. ALMOST SUNRISE is truly special and must be seen.